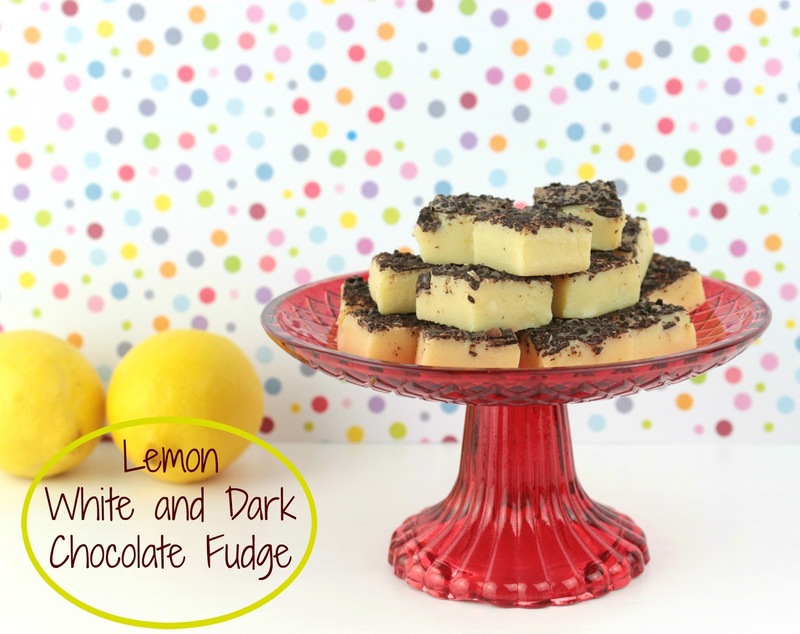 Lemon White and Dark Chocolate Fudge! Yummy recipe and really easy to make with a few ingredients and in less than 10minutes! Is there anyone that does not like chocolate? Anyone? Even having a tiny bite??? Well, I am a huge fan and whenever I am desperate for something sweet, even a small chocolate bite is enough! 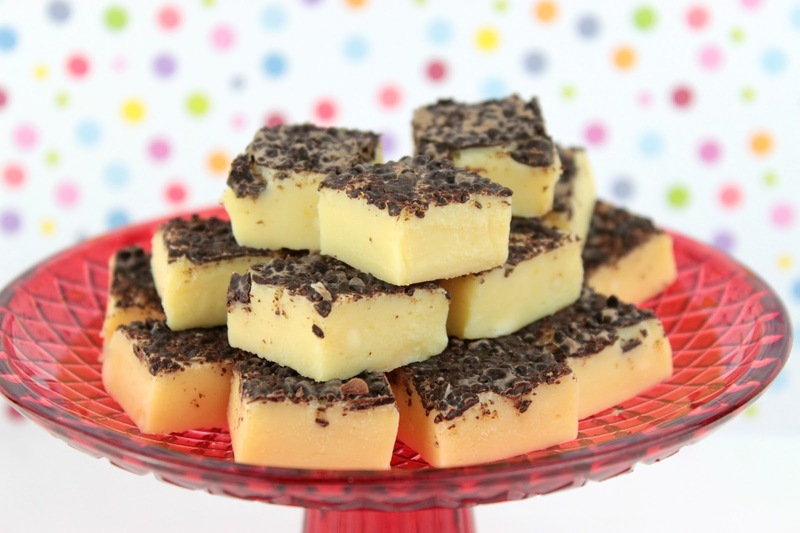 The best way to prepare something easy and to experiment with the taste, is of course Chocolate Fudge! 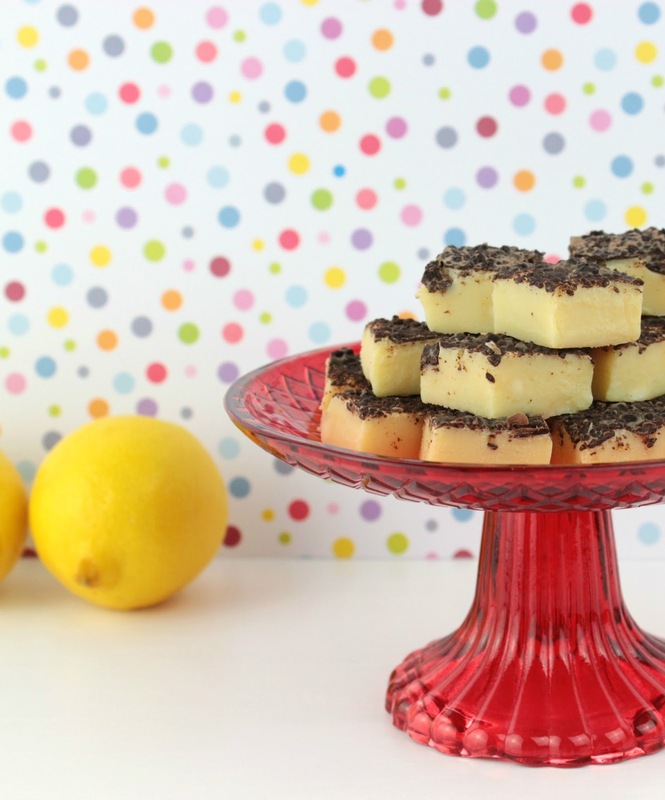 This time with two different colors for my chocolate and with amazing aroma of fresh lemon… we are on Spring, remember??? I remember myself when I was preparing for the exams to pass in a univercity, the last days of studying I was desperately wanted to taste something sweet…to clear my mind! Really is this a joke or just an excuse to eat chocolate? I do not know, but what I know is that the last ten days before the exams I was home studying and eating only chocolate! no food at all! The results? Five kilos more but at least I was in the Univercity… success! 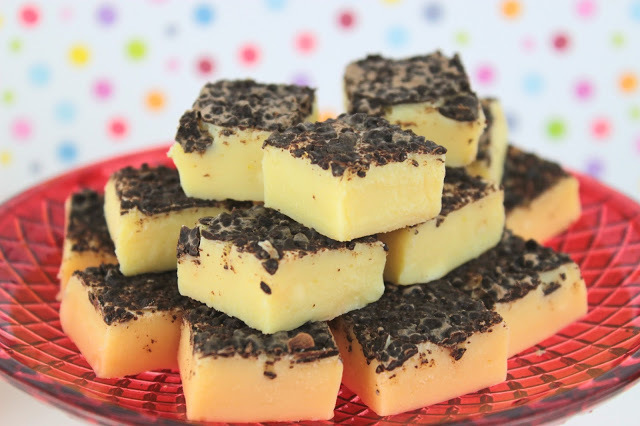 Chocolate Fudge is my favorite sweet to make. Everytime this is the easier dessert to prepare and offer as a gift to a friend or to have it as party favours. And everytime I have too many chocolates in my home (you know, chocolates from godmothers and friends and grandparents…) it is the perfect way to “recycle” them and to taste them in another way! My love for white chocolate is huge! But combining something sweet with something salty or something spicy or even something fruity, is my passion! You know… chocolate with potato chips! Yes I know, I am crazy!!! 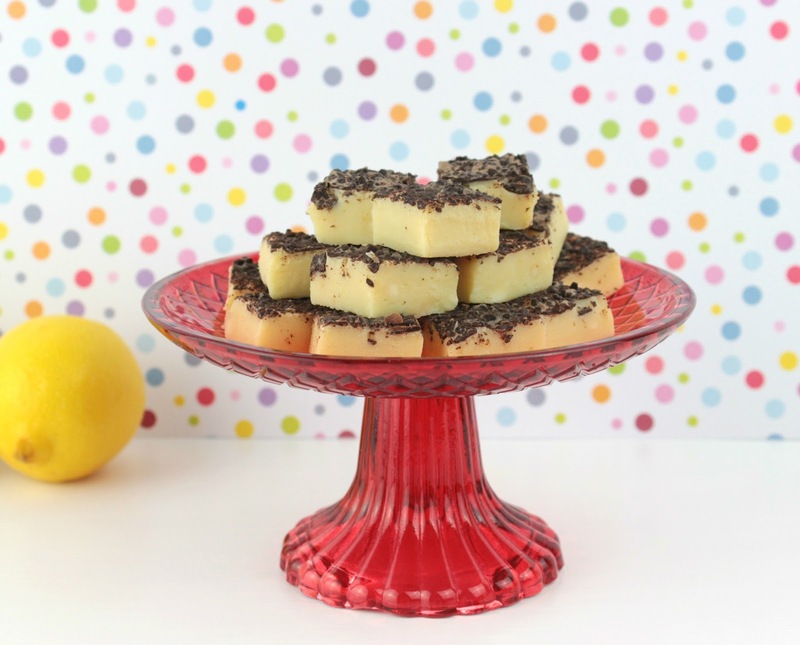 This time lemon is the main aroma in my sweet bites, since it is the most favorite fresh vegetable of the season! And these lemons are from my own lemon tree!!! The procedure is the usual one for making Chocolate Fudges. In a cooking pot warm the condensed milk in medium heat. Add the white chocolate pieces, start stiring until the chocolate is melt. Add the butter, the lemon extract and the lemon icing. Stir them again until the mixture is homogeneous and put it on a baking pan covered with aluminium foil. Let it cool for five minutes and then add the dark chocolate chips. If the mixture is hot enough, the dark chocolate will also melt. If you do not want this, just allow the mixture to cool more before adding the dark chocolate. Leave it to cool and then put it to the refrigerator to cool some more. Cut it in pieces and they are ready to enjoy them!!! I hope you will like them! Bon Appetite! Eγώ στις Πανελλήνιες, δηλαδή όλην την χρονιά της Γ Λυκείου,κάθε ημέρα έτρωγα μία σοκολάτα 3bit απαραιτήτως,5 κιλάκια μπορεί και παραπάνω τα έβαλα και γω,αλλά φύγαν μόνα τους πολύ γρήγορα,νιάτα ήταν αυτά,όχι όπως τώρα! !Αγαπώ σοκολάτα και λεμόνι,οπότε θα δοκιμάσω τις σοκολατολεμονένιες μπουκίτσες σου σίγουρα!! !Καλημέρα Ζήνα!!! Η αληθεια ειναι οτι δεν ειμαι λατρης της λευκης σοκολατας αλλα αυτος ο συνδιασμος με λεμονι πραγματικα με προκαλει να τα δοκιμασω! Ω ναι… το λεμονι τα αλλαζει όλα! και εχει και μαυρη σοκολατα 🙂 σα παγωτακι ενα πραγμα! Για ποτε το κατεβάζω το πυργάκι σου δεν θέλω να το σκέφτομαι! Πολύ απλό και ταυτόχρονα εγγυημένο γλυκό. Νομίζω ότι αυτά τα fudge είναι το επόμενο στάδιο μετά τα σοκολατάκια. Η εξέληξή τους βρε παιδί μου. Και το styling σου μου αρεσει πολύ Ζήνα. Είναι χαρούμενο κι ανοιξιάτικο πολύ! Φιλάκια από μένα και καλό ΣΚ! Με τα σοκολατακια παλι δεν το χω βρε Χρυσαυγη μου! Μιλαμε καμια επιτυχια! Ενω αυτά είναι πιο εύκολα και χωρίς περίτεχνα σχεδια. Πω πω τι φοβερή συνταγή…ως εδώ μου έφτασε το άρωμα!!!! Επίσης τι υπέροχη παρουσίαση φωτογραφίας!!! Στα υπόψιν! Χιλια ευχαριστω Μαρακι!!! Θα τα φτιαξω να τα δοκιμασεις την επόμενη φορά! Εσύ το απογείωσες το θέμα! Όλο με παρασέρνεις και έρχεται καλοκαίρι! χαχαχαχαχα ελα ελα, εχουμε χρονο ακομα!